This is a pic from the project I'm working on, called the Digital Sunlite Project. It's a 3d peer-to-peer online world. World state is not held at a central point but distributed among participants. Anyone can create objects. A dodgy consistency algorithm eventually ensures 'local' consistency among peers' world state views, where local means 'close in the cyberspace'. Another dodgy routing algorithm routes discovery messages to peers 'close' to you in cyberspace when you connect. I'm using C++, with OpenGL and raw Windows sockets for the networking. In the pic you can see a fellow peer, represented by a Piccolo avatar. You can also see a static highway model. 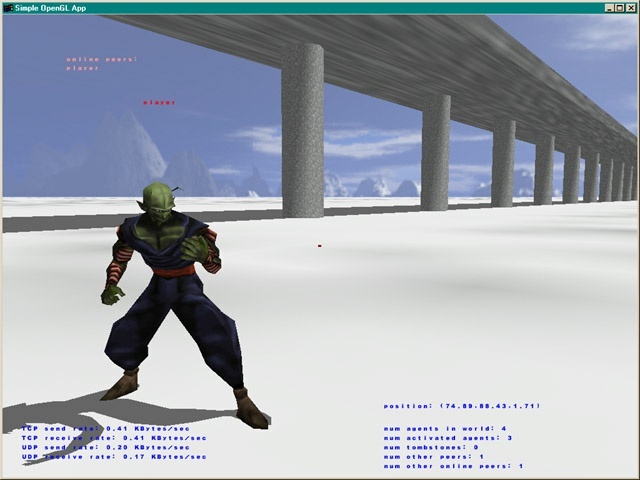 I generally use Quake2 models (.md2) for the avatars, and .3ds models for the static objects. Right now the project is still very much in a development/testing state. Some very large problems such as object persistance and social control have yet to be solved. I'm looking for testers, content creators, and people who can run servers.